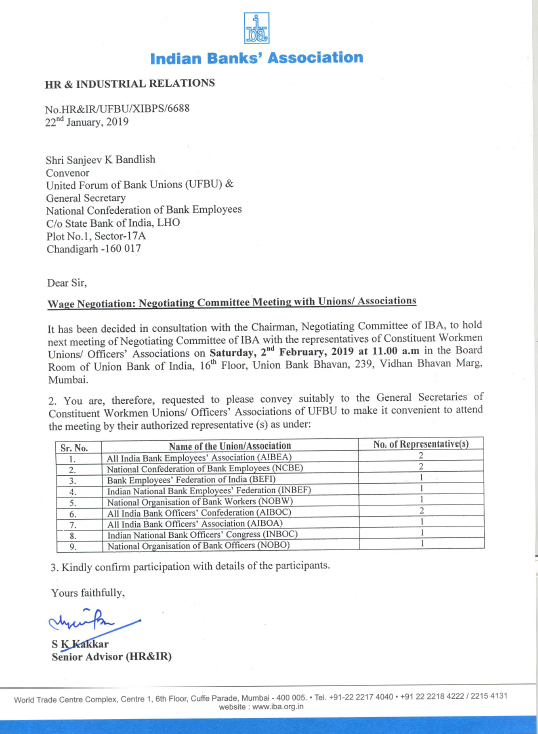 “it has been decided in consultation with the Chairman, Negotiating Committee of IBA, to hold next meeting of Negotiating Committee of IBA with the representatives of Constituent Workmen Unions/Officers’ Associations on Saturday, 2nd February, 2019 at 11:00 a.m in the Board Room of Union Bank of India, 16th Floor, Union Bank Bhavan, 239, Vidhan Bhavan Marg, Mumbai. Sanction of all stagnation increments to clerical employees once in 2 years instead of once in 3 years up to 5th stagnation increment as at present. IBA agreed that some improvement may be considered subject to cost implications. Sanction of stagnation increment to employees who got/get reversion after a period of 12 months. IBA agreed to examine the issue by collecting details from the Banks. PQP/Graduation Pay should be equal to 1st stage of Basic Pay. IBA was inclined to agree subject to working out the cost. Sanction of additional increments to sub-staff for passing graduation/ JAIIB/ CAIIB. IBA was positive on the issue but stated that cost implication would have to be kept in mind. 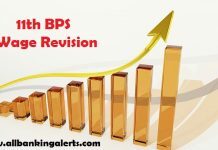 Updation of pension of all past retirees at a common index point as would be applicable under 11th BPS. Our demand would be studied for consideration. Payment of Project Area HRA at branches opened in Special Economic Zones, Export Promotions, etc. It was agreed in principle. Introduction of Leave Bank. IBA agreed to examine the issue in detail based on the Note submitted by us and then decision will be taken. Exemption of GST on premium payable on medical insurance. Matter has been taken up with the Government and would be followed up. Extension of time up to 15-2-2019 for retirees to renew the medical insurance policy for the year 2018-19. IBA agreed to take up with UIIC for their approval. Payment of Gratuity under Bipartite Settlement – 20 months’ Pay without the restriction in service period between 15 and 30 years. 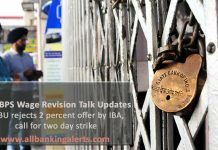 Unions to give a Note to IBA for their consideration where after the issue will be discussed further. Calculation of Pension based on last drawn pay or on average of last 10 months whichever is beneficial to employees. Matter will be taken up with the Government for their approval and amendment in Pension Regulations. Sanction of full pension on retirement after 20 years instead of present 33 years. Matter will be taken up with the Government for their approval and amendment in Pension Regulations. Management’s contribution at 14% of BP+DA under New Pension Scheme. Matter will be taken up with the Government for their approval and amendment in the Scheme. Service Charges levied on employees under NPS to be borne by managements or Fund Managers. IBA agreed to issue clarifications. Introduction of special compensatory provisions for employees working in North East, Jammu and Himachal Pradesh. Matter will be taken up with the Government. 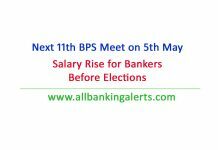 5 Day Banking – remaining Saturdays to be declared as weekly holidays. Matter will be taken up with RBI and Government. Stopping outsourcing of regular and permanent jobs in the Banks. IBA stated that the Banks are following the guidelines of RBI in this regard. We did not agree with their contentions and reiterated our demand. Sanction of sabbatical leave to employees up to 2 years in service period as is available to government employees. IBA stated that the issue needs further discussion. Sanction of Child Care Leave for women employees. Unions to submit Note to IBA and the issue will be discussed further.